Whether it’s a young man taking his first venture into the world of cigar smoking, or a finely aged, cigar aficionado reaching one of life’s milestones, there is no greater gift for a gentleman’s birthday than the gift of cigars. Available exclusively from our website, the Celebration Sampler is a collection of light cigars for light-hearted celebrations. This sampler is perfect for a gentleman who is perhaps not a cigar smoker but would like an introduction into the world of cigars. A younger man would really appreciate these light-bodied smokes to give them their first smoking experience. Montecristo Open Regata – notably leathery and sweet, light bodied and perfectly smooth from start to finish. San Cristobal De La Habana La Fuerza – very light, cool and smooth throughout; it is perfect for giving that classic Cuban profile, but without the fuller, mustier note that punchier cigars possess. There is plenty of cedar, minerality and coffee bean notes throughout, it is a nice, delicate smoke. El Rey Del Mundo Choix Supreme – a complex range of flavours yet very approachable due to its light body; it is a delicious smoke with cedar and earthy tones at the base, that picks up a leather tone halfway through. 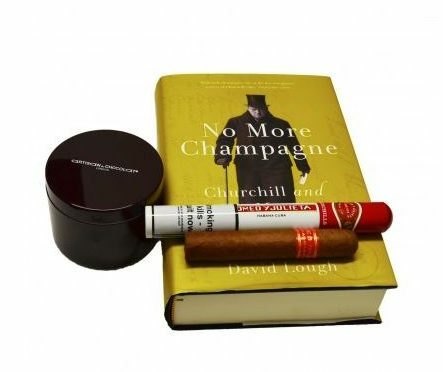 A gift set perhaps for an older gentleman; the Churchill Gift Sampler includes the ultimate Churchill cigar, the Romeo Y Julieta – considered to be Churchill’s brand of choice –, a Partagas Serie D No.4, the perfect introduction to fuller body cigars, and finally, a compelling read to get stuck into whilst you smoke: No More Champagne. No More Champagne is the untold story of Winston Churchill’s precarious finances – the most original and surprising book about Churchill to emerge for many years. Along with the cigars, Artisan du Chocolat’s signature liquid caramel is also included to enjoy whilst reading. The Indulgence Gift Set truly earns its title. This luxurious set includes four cigars and three bars of chocolate, making it a truly indulgent gift set for the gentleman who enjoys the finer things in life. The Por Larranaga – goes well with chocolate due to the honey and sweet notes that can be drawn from the cigar. The Ramon Allones – a punchy, earthy, peppery and yet undeniably smooth full-bodied cigar that works very well with the tobacco chocolate. The Trinidad Reyes – one of the best cigars on the market and rightly so; it possesses the peppery quality of a Montecristo and those same earthy/grass notes as the Cohiba Siglo range, the balance of this lighter bodied smoke is excellent. 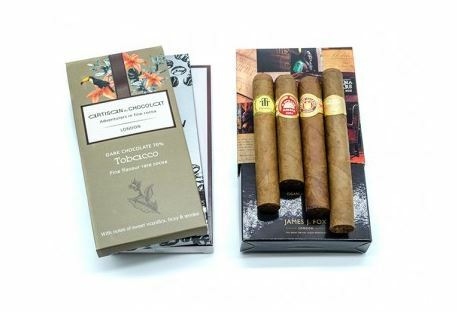 Finally, the gift set includes an H. Upmann half corona, a must smoke that may not last long, but its flavour is intensely impressive, it includes slight notes of coffee. For a gentleman who loves to indulge his senses, this gift set is the perfect birthday gift. 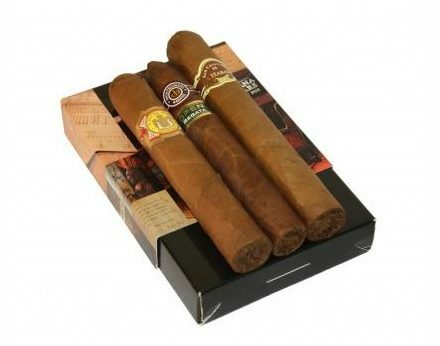 For the true cigar aficionado, the Ultimate Gift Box Sampler is the ideal gift. 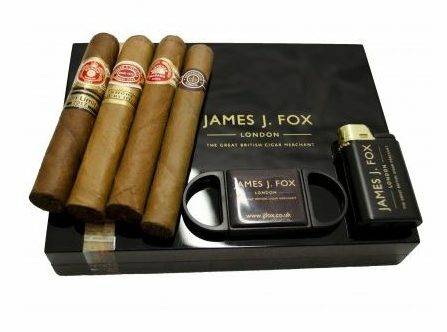 This set comes complete with our JJ Fox gift box lighter and cutter. We have selected four cigars of high intrigue and popularity. The Montecristo No.4 – this cigar continues to be the most popular cigar in the world, and has been included for this reason alone, if not for its wonderful full body, spicy and peppery notes throughout. The H. Upmann Connoisseur No.1 – a sensible, medium bodied cigar packed with cedar, leather and charcoal flavours, with a dash of black pepper that winds its way through as the smoke progresses. The Romeo Y Julieta Short Churchill – notable for the notes of cedar and earth in similar measure, with a toasty aftertaste and faint hint of spice. Punch Regios de Punch – a limited edition cigar released in 2018. This cigar has a leathery aroma and sweetness all the way down, flavours of oak and earthiness and a medium to full strength that has a creamy feel that makes the smoke just that more pleasant.  For a gentleman’s upcoming birthday, give the gift of a cigar gift set from JJ Fox.